This Thursday, thanks to the Polish Cinema for Beginners, we will travel to Portugal. Another screening that will be presented in the New Horizons Cinema, as a part of the 9th season of our review, is “Imagine” directed by Andrzej Jakimowski. Our special guest will be Tomasz Gąssowski – author of the film’s music score. A charismatic teacher for the blind Ian (English actor Edward Hogg) arrives to Lisbon to teach the residents of the institute for the blind the techniques of echolocation - evading obstacles by means of acoustic echo, allowing free movement without the use of sight. He quickly becomes an idol of blind kids living in the institute, and attracts the attention of the beautiful Eva (Alexandra Maria Lara). However, there is a doubt as to whether Ian is a messiah or a charlatan. Does he help to awaken hope and face reality or expose the students to danger? Created in an international co-production, the third film by Andrzej Jakimowski – one of the most respected Polish authors in the world, with his distinct, focused style – poses questions of existential nature and creates a magical portrait of the Portuguese capital. Imagine‘s premiere was held at the Toronto Film Festival, and the film was subsequently awarded for directing at the Warsaw Film Festival. 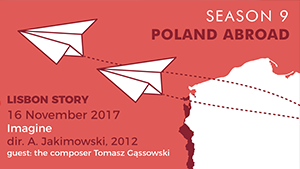 Our special guest will be Tomasz Gąssowski – musician, composer, music and film producer, member of the Polish Film Academy. He has worked closely with director Andrzej Jakimowski, whose films he co-produces and writes music for them. Titles such as Squint your Eyes (2003), Tricks (2007) and Imagine (2012) have been awarded many times in Poland and abroad. He also directs – his short The Play-Off (2016), produced by Munk Studio, and was awarded at this year’s Transatlantyk Festival in Łódź. The screening of “Imagine” will take place on the 16th November at 8 pm in the New Horizons Cinema. Tickets can be purchased before the screenings at the ticket offices and at KinoNH.pl website. More information about the project can be found at: PolishCinema.com.pl and facebook.com/PolishCinema. You are invited to the Polish Cinema for Beginners by the Wrocław Film Foundation.